In early 1996, esteemed colleague and designer-educator Thomas S. Bley invited The Professor to join with him in a presentation to be given the 6th of June at the International Design Conference in Aspen [Colorado]. 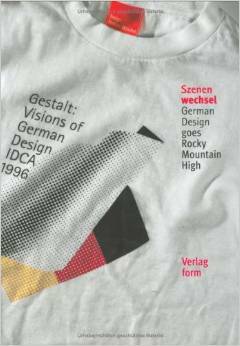 The theme of that year’s IDCA was “Gestalt: Visions of German Design,” and it was focused on the past, present and future of German industrial design. The presentation that The Professor did with Professor Bley focused on the next generation of designers—graduate as well as undergraduate design students—and its topic was that never-a-dull-moment subject of educating the still-in-school cohort. Like the now-extinct ID Magazine [where The Professor cut his journalistic teeth], the IDCA began in the early 1950s. Launched via the industrialist Walter Paepcke to be a humanizing influence on the creative professions, the IDCA began at a time when Aspen was still a small-town destination, not the name-brand celebrity hotspot and photo-op that it has become. Paepcke hoped that exposure to the rawness and beauty of Aspen’s atmosphere would be a strongly positive influence on the mainly city-bound attendees who came. Suffice it to say, The Professor’s talk with Professor Bley was given to a small group of the Aspen Hardies, those attendees who go to every session possible, even those that take place during the late afternoon nap period [as this one did]. Presented in the spirit of an open-ended discussion, the talk drew perhaps 30 attendees in sum [or, something like a whopping 5% of the total possible audience in town for the conference]. Afterwards, the talk and its content evaporated into the great bin of unrecorded history [with perhaps a special placement in the “Esoteric & Invisible” section of the bin]. Because of that, The Professor’s part of the presentation has been unavailable in any print, video or online format up until this day. His part of the presentation went as follows, and it is posted here for the first time anywhere as part of The Professor’s ongoing effort to more widely share some of his early thoughts [the hits as well as the misses]; some present-day comments have been added below—dated and in italics—so that their newness is clear. This rampant post-credibility means that things are not “normal” because abnormality has become our new way of being, our new norm, just as the Italian theorist Andrea Branzi claimed it was in his epic Domestic Animals [“Towards an abnormal normality,” unnumbered page, MIT Press, 1987]. This means that it’s no longer sufficient to say that “Form Follows Function.” That formula—the one that worked so well for German modernists such as Walter Gropius, Mies van der Rohe and other leaders [and followers] of the Bauhaus and Ulm design schools in Germany [and American architects Louis Sullivan and Frank Lloyd Wright before that]—needs to change to reflect the changed truth of our times. Now Form Follows Media in all outward or external directions [and Form Follows Me for all inward or internal matters]. [As a not insignificant aside, The Professor proposed a compilation-essay book entitled Form Follows Media to MIT Press in 1989; he was turned down without much explanation. It’s not been easy for The Professor in this regard: although he has found his share of professional successes, he has also had his fair share [or more] of Big Ideas that were summarily [and often repeatedly] dismissed. It’s not easy seeing the future when others don’t, or can’t]. This means that we as design educators need to assist our students in seeking out what anthropologist Gregory Bateson called “the patterns that connect.” More than ever before, teachers need to be creative agents of connection: pattern-makers and idea-consolidators between disparate areas of knowledge. But we need to make this lesson explicitly; put another way, design students will only become pattern recognizers [in addition to remaining the creative conceptualizers of material things] when design education comes to revolve around discourse, critical theory and the idea of dialectic rooted in modern German intellectual history—most notably, in the Frankfurt School [the name given to the group of theorists that included Walter Benjamin, Jurgen Habermas and Erich Fromm, among others] . This means that today’s students know on some level, consciously or not, that what looks confusing, random and overwhelming on one level can give way to a higher-level understanding on another. Complexity emerges out of simplicity. Complexity leads to overload, and overload leads to the discovery and recognition of new patterns. This means that the recognition of new patterns leads to a new type of literacy, a new visual literacy that is presently under construction in all parts of Western society, partly driven by design’s expanding role and partly driving designers to do more, offer more, and be more connected to other professional areas of knowledge. [Again, in 2014, coming to terms with info- and image-overload is even more crucial, as is possessing a strong concern for visual literacy and the comprehension of what “design” can offer to all members—at all levels—of society].
. The principle of paradox will assume greater importance as culture collages upon itself with increased speed, influence and urgency. Qualities such as a new softness in materiality, a new tactility in interface, and a new hybrid sensibility in composition [in terms of what materials, details, technologies or historic periods can go together] will emerge. In our global economy of information-, image- and product-overload, it is clear that hardware has to become softer. Customizable, flexible, foldable, huggable, rubbable and wearable technology is starting to show up in classrooms and not a moment too soon. Realizing that, if you’re an industrial designer, it’s no longer about designing the product, it’s about interacting in an improvisational dance-like process between the consumer on one side and the manufacturer on the other, proactively entering into an area where designers can justifiably create anticipation and a fuller range of sensory responses in the lives of those who experience the product. Bringing together samples [in the same way that rap, techno and other contemporary music has done] from previously separate sources. Students intuitively now know that a new generation of design is arising from multiple sources streaming together; hybrid psychologies and emotionally-infused technology convergences will rule the day. Emotionally-based product convergences: furniture with embedded microprocessors, for example; the effect [will be] that cameras that behave like computers, and computers [that] behave like cameras. Creating point-of-view, the single scarcest resource we have according to American futurist Paul Saffo, amidst our hyperabundant overload of all possible data. Objectivity is a myth; subjectivity must be embraced; POV is all. A new area of inquiry [named by The Professor], PMPA is the study of how people change mass-produced goods to precisely and appropriately fit their real needs, wants and desires. It includes, for example, the message-and-art centers that refrigerator doors have become; sneakers that are altered by graphics and colors applied by either hand or machine; boomboxes and skateboards festooned with decals and stickers [Sorry to the early Austrian architect Adolf Loos, but ornament is no longer a crime]; the grip handles added to everything from fishing rods to ice axes to work tools that are cushioned, reshaped and made more usable; and, of course, bicycles, motorcycles, cars and trucks that have all been customized for the special circumstances of individual driver-operators [in a way fulfilling—through the side door—the promise foreseen by mass-customization pundit-prophets such as the American author B. Joseph Pine]. Making our hardware more nature-inspired, biomimetic-based. “Replacing mass with information” [as the American inventor Buckminster Fuller used to say], making products lighter and smaller through the substitution of intelligence for material; it’s the new and greener eco-economics. Teaching design students of today to build their projects around experiences and stories, bringing the element of narrative back into the elaboration of form, the expression of function, and the creation and production of meaning. Incorporating the accidental, the mistake, or the failure into the final result [at a higher level]—and taking responsibility as a designer-citizen for whatever imagery or iconography is used; the computer isn’t the solution—it’s the catalyst for bigger changes. The subject of Design [and Design Quality] might be greatly augmented by bringing its subject matter into mainstream television, cinema and the Internet. In the 1970s, “design” was covered in specialized trade magazines; in the 1980s, design expanded to a much larger group of consumer magazines and newspapers; in the 1990s, the action will center around taking design—its iterative and magical process, its creative characters, its narrative content—and putting it on-screen and online for an exponentially larger audience. We need to see and hear design news on CNN, MTV, ESPN and even create a “design network.” [In this way, the design profession of 2014 might be participating in the movement toward global interdependence that the pioneering Czechoslovakian statesman and essayist Vaclav Havel began writing about after assuming the Czech presidency in the early 1990s]. Design’s subject matter must be taught at the best universities. To put it in American terms, when industrial design, graphic design, illustration and photography are taught at Harvard, at the graduate level, then we will know that design has arrived. Emphasize team-based problem solving. Due to the scale, scope and schedule of many current projects, it simply isn’t possible [or desirable] for one person to know or do it all. The subject of design must be taught in high school, junior high school, and even elementary school—as well as in MBA programs and boardrooms. Then we might have children who understand the role that design plays in consumerism, as well as have decision-makers who are religious about using design for competitive market advantage. History must be the foundation for fostering connectionism between ideas, projects and the development of personal design philosophies. Some component of design history, for example, must be taught in every design studio. At CCA[C], we have made resident design historian Barry Katz a studio critic to underline the importance of history [and material culture] to the creative process. To know where we design students are going, we need them [more than ever] to know where our predecessors have been and what our cultural history is about. Get rid of tenure and invest instead in local or national educational “teaching treasures” by putting them into the great state universities. Everyone else should be on a prove-it-or-lose-it contract. As [the American author and management consultant] Tom Peters points out, knowledge workers such as designers and teachers might find that they do one job on Mondays; a second on Tuesdays and Wednesday afternoons; a third job on Tuesday, Wednesday and Thursday mornings; and a fourth job on Fridays. Educational institutions must be reorganized along the fragmented lines of the new information economy. For students designers wishing to create advanced technology products, there is no such thing as schooling that begins or ends at a finite date. The same is true with respect to graduates in all areas of design and all other realms of creative endeavor. There is only one way: a commitment to lifelong learning, a commitment to educational growth, a commitment to research, and a commitment to the design process in the largest sense. There is no comfort in this scenario, but there is pleasure. As the American basketball coach Pat Riley once said of his time with the Los Angeles Lakers, “one can be pleased but never satisfied” with one’s accomplishment; as educators, we need to ensure that design students have done all that they can do. In closing, remember that these thoughts and proposals are all part of a larger work-in-progress at California College of Arts & Crafts and elsewhere; a culture of informed experimentation increasingly pervades design schools. And don’t forget that when they show Wimbledon tennis matches in Germany [on RTL, for example], the camera, immediately after each point ends, the camera focuses on the player who lost the point; in the good old USA, home to the Aspen Design Conference, the American cameras focus on the winner of the point. That’s not an insignificant distinction. Just as America is about the future [having no burden of history] and Europe is about the past [having no vision of the future], we need design students who reach for both, who call the dominant paradigm into question, and who urge it into crisis [and that’s why they call me The Professor]. * n.b. The Professor had discussions in 1991 and 1992 with several professors at Stanford University, including Jim Adams, Bill Moggridge and David Kelley, about staying on for a Ph.D if he could find a way to do his doctoral thesis in PMPA studies; it was determined to be too interdisciplinary of an idea to find a sponsoring department on campus.